Where does NYC’s commercial waste go? 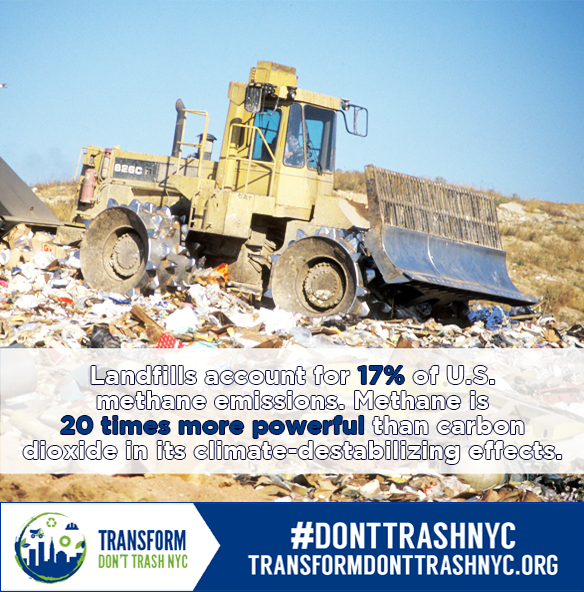 Transform Don't Trash NYC is proud to premiere “Where does NYC’s commercial trash go,” a short animated video that looks at how the unregulated commercial waste industry in New York City is endangering workers, destroying the environment and overburdening low-income communities and communities of color with waste. The coalition partnered with the Center for Urban Pedagogy and animator Cole Hannan, along with Teamsters Joint Council 16 members Allan and Plinio and community members from The POINT CDC to produce the video. 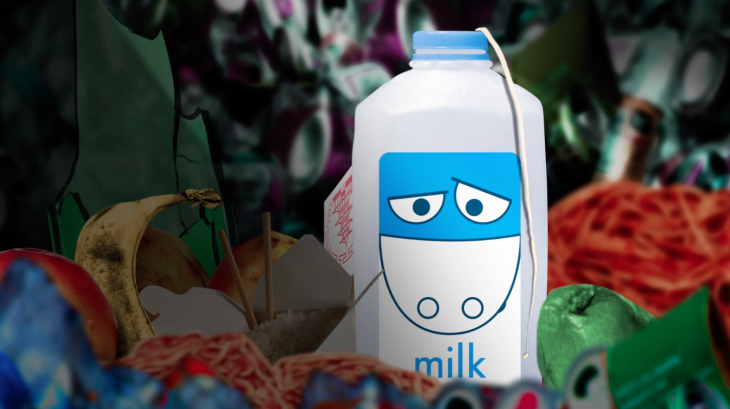 Where does the recycled waste go? Recycling infrastructure just doesn’t exist in many cities around the country, especially for small businesses. Real recycling will take more than individuals doing their part—it will take cities stepping up to transform trash. 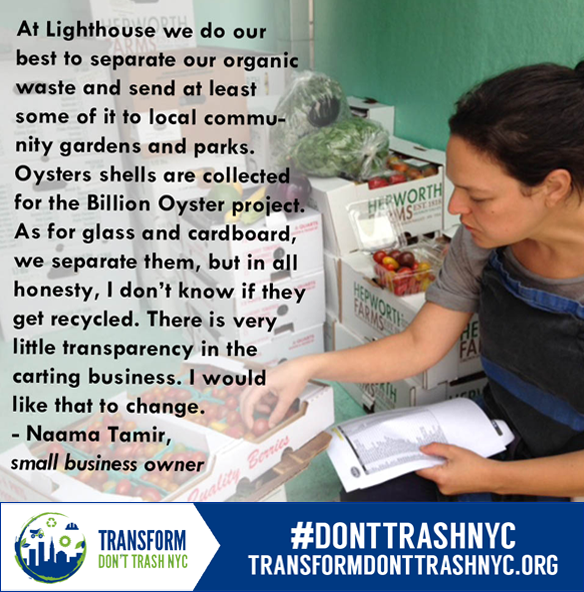 Join our campaign to transform NYC's commercial waste system and to make your voice heard for increasing recycling for good jobs and healthy communities for all: http://bit.ly/tdtsignup. Landfilling waste emits 30x more Greenhouse Gasses than recycling it.1 According to the EPA, the methane gas emitted by landfills is a global warming agent 20x more potent than carbon dioxide. If we recycle more in the waste industry, we can combat climate change and create good new jobs. Join our campaign to transform NYC's commercial waste system and to make your voice heard for increasing recycling for good jobs and healthy communities for all: http://bit.ly/tdtsignup. How many jobs can we create through recycling? We could create hundreds of thousands of good jobs in recycling processing and related industries just by raising our recycling rates across the nation. Instead we’re sending millions of tons into incinerators and landfills. 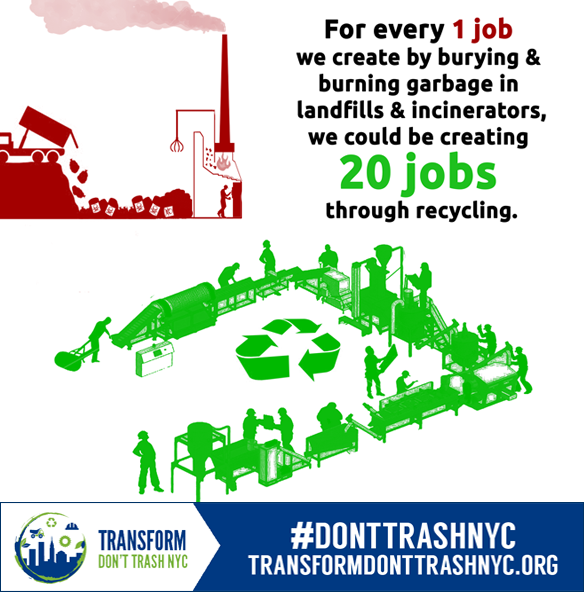 Join our campaign to transform NYC's commercial waste system and to make your voice heard for increasing recycling for good jobs and healthy communities for all: http://bit.ly/tdtsignup.